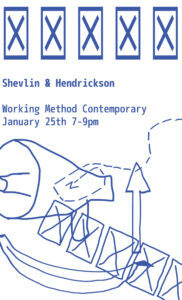 The Working Method Contemporary Gallery (WMC) is pleased to present, XXXXX, a two-person exhibition by Patrick Shevlin and Kelly Hendrickson. The show opens on January 25th at the WMC in the Carnaghi Arts Building (CAB). Please join us for a reception with the artists from 7 – 9 pm.